Definition at line 23 of file Cr250.h. Definition at line 54 of file Cr250.cpp. Definition at line 61 of file Cr250.cpp. Definition at line 147 of file Cr250.cpp. Definition at line 103 of file Cr250.cpp. Definition at line 106 of file Cr250.cpp. Definition at line 109 of file Cr250.cpp. Definition at line 100 of file Cr250.cpp. Definition at line 97 of file Cr250.cpp. Definition at line 63 of file Cr250.cpp. References mBuffer, mIndex, mSeed, and myrand(). Linear congruent pseudorandom number generator for initialization. Return a pseudorandom number in the interval 0 <= n <= 32767. Definition at line 153 of file Cr250.cpp. Number returned by r250() is in the interval 0 <= k <= 65535. Definition at line 112 of file Cr250.cpp. References C_INT16, mBuffer, mIndex, and CRandom::mNumberU. 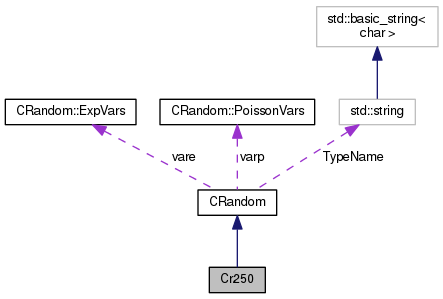 Referenced by dr250(), getRandomCC(), getRandomOO(), getRandomS(), getRandomU(), and r250n(). Number returned by r250() is in the interval 0 <= k < max. Definition at line 131 of file Cr250.cpp. References C_INT16, max, CRandom::mNumberU, and r250(). 140 r250(); // Why a second call? Definition at line 34 of file Cr250.h. Referenced by initialize(), and r250(). Definition at line 30 of file Cr250.h. Definition at line 32 of file Cr250.h. Referenced by initialize(), and myrand().